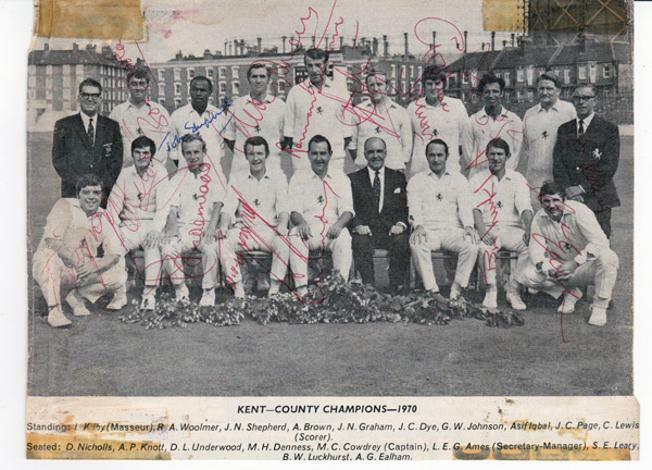 Signed B&W press photo batting for Kent against Surrey at the Oval in August 1968. 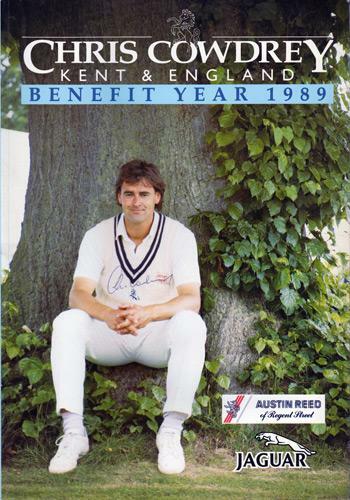 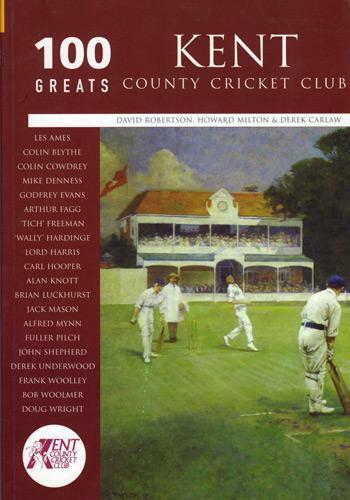 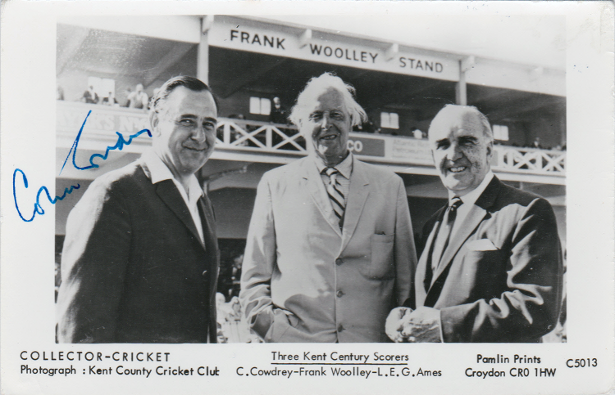 "Three Kent Century Scorers" also featuring Kent cricket legends Frank Woolley & Les Ames. 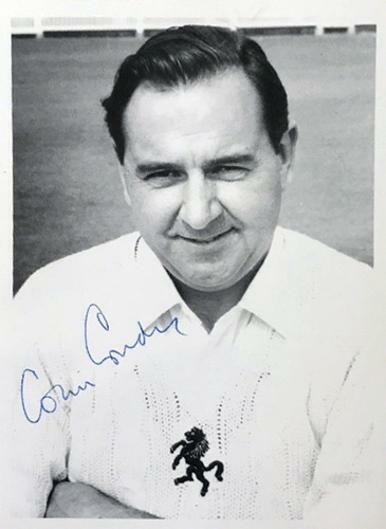 Signed B&W portrait photo postcard. 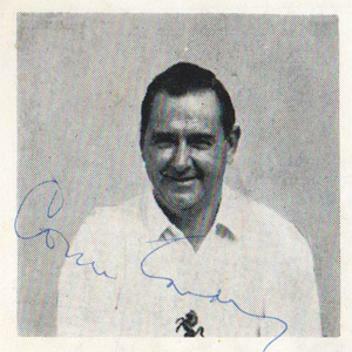 Signed B&W England batting mag pic. 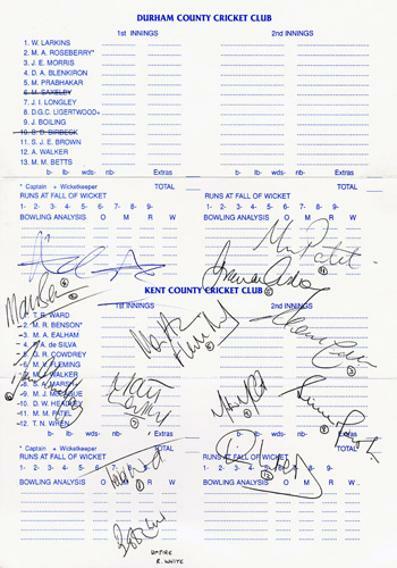 Signed colour Kent CCC batting pic. 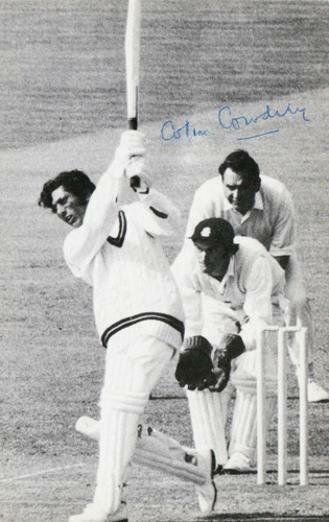 Also featuring Zaheer Abbas & (KCCC team-mate) Alan Knott at Edgbaston in 1971. 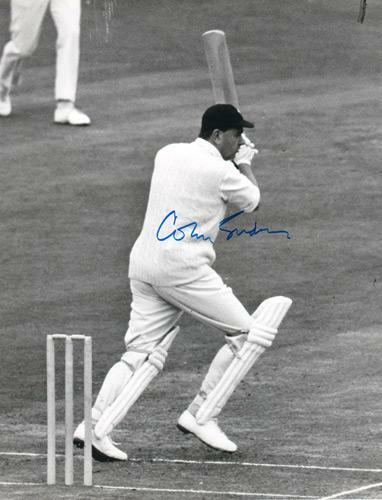 Signed 1960s B&W newspaper pic - batting for England. 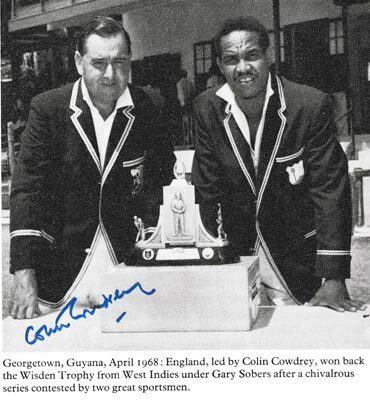 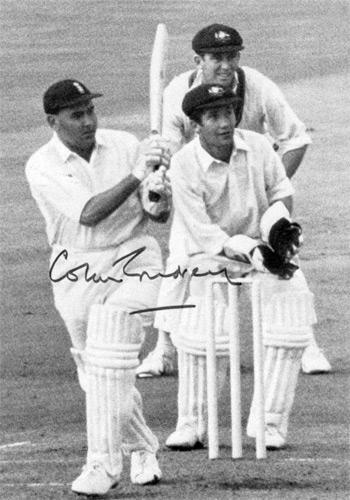 Approx size: 4" x 3"
Signed 1968 B&W magazine pic - showing Cowdrey and opposing West Indies captain Gary Sobers after the Guyana Test Match, which saw England win back the Wisden Trophy. 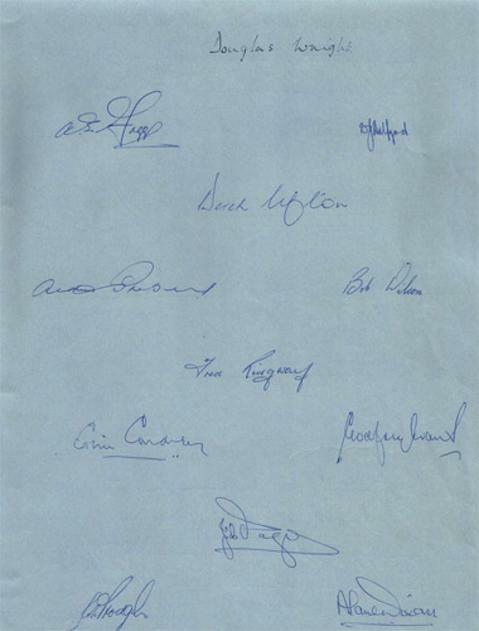 Collection of 4 x Signed 1950s / 1960s B&W newspaper pics. 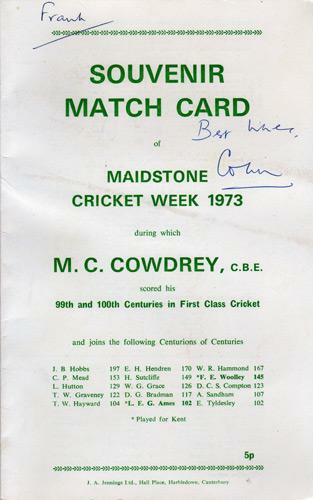 Cut outs / Scrapbook quality"
1973 Kent CCC Maidstone Cricket Week Commemorative Scorecard celebrating Colin Cowdrey's 99th & 100th First Class Century. 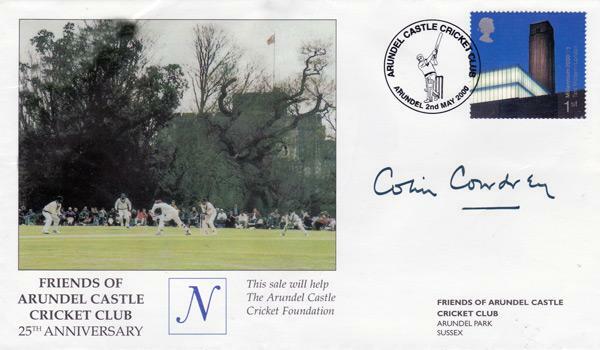 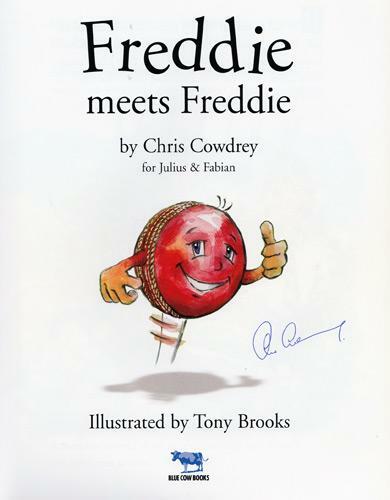 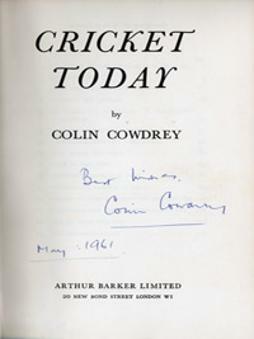 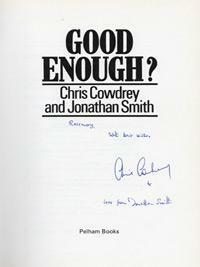 Souvenir Match Card signed & dedicated by Cowdrey. 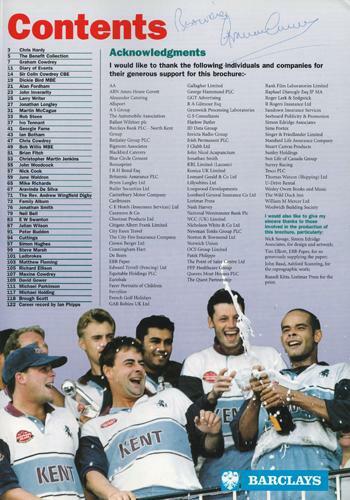 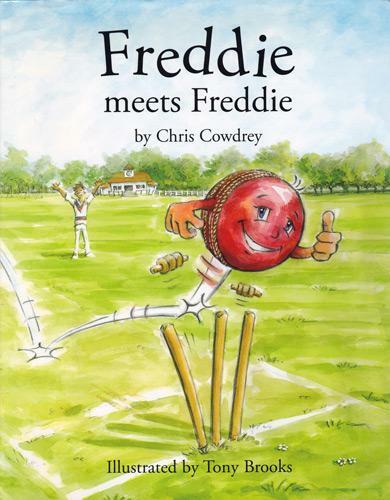 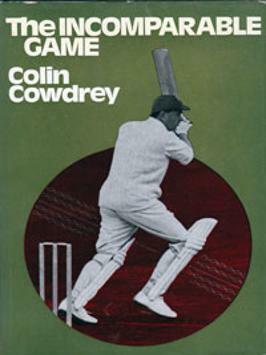 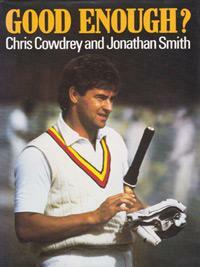 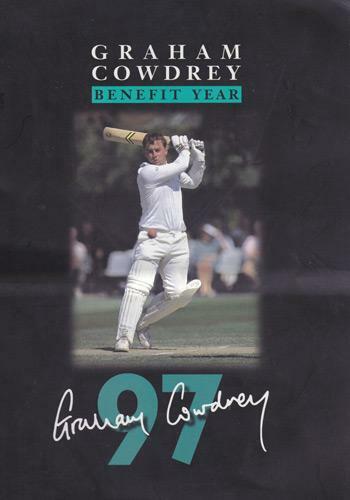 Four page pamphlet comes with printed scorecards for both innings and a career list of Cowdrey's one hundred 100s. 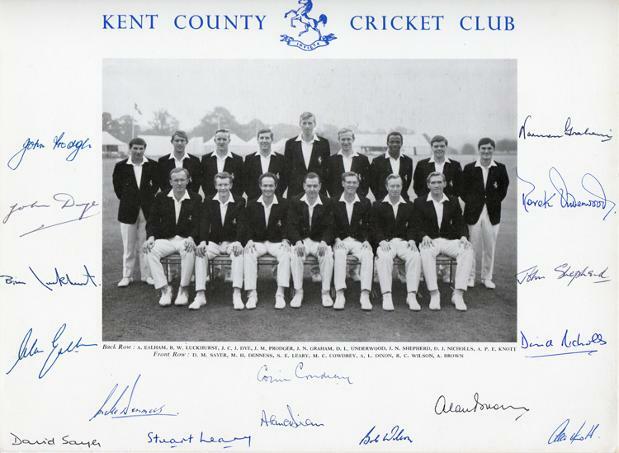 1973 Kent CCC Maidstone Cricket Week signed B&W magazine picture celebrating Colin Cowdrey's 100th First Class Century. 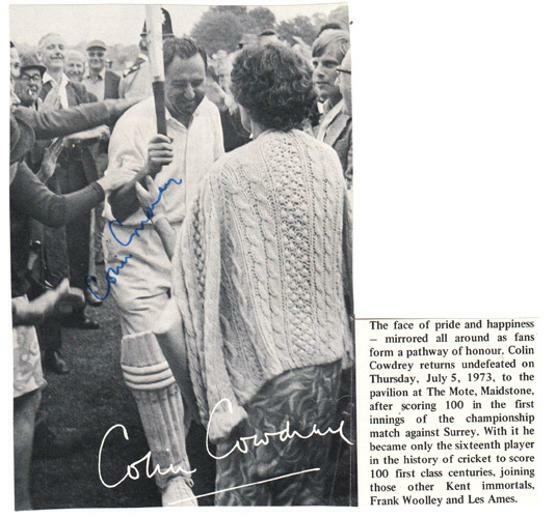 The caption reads: "The face of pride and happiness ... mirrored all around as fans form a pathway of honour, Colin Cowdrey returns undefeated on Thursday, July 8 1973 to the pavilion at The Mote, Maidstone after scoring 100 in the first innings of the championship match against Surrey. 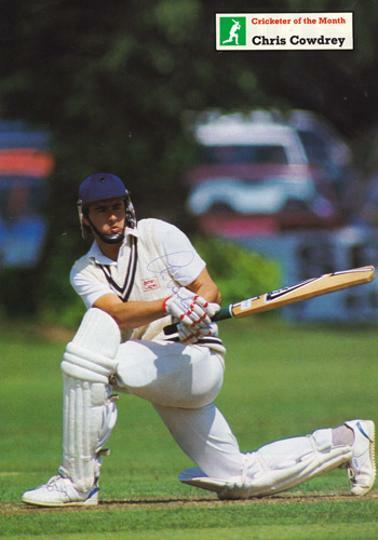 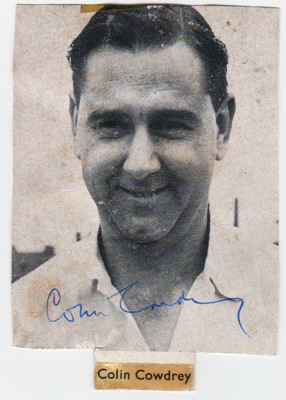 With it he became only the sixteenth player in the history of cricket to score 1090 first class centuries, joining those other Kent immortals Frank Woolley & Les Ames." 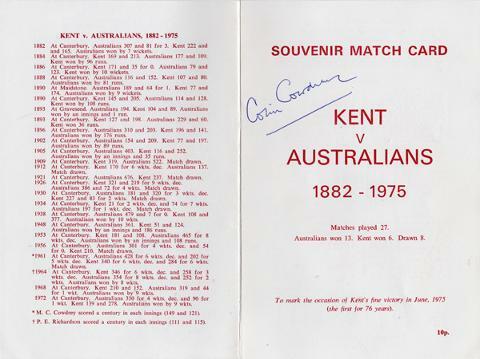 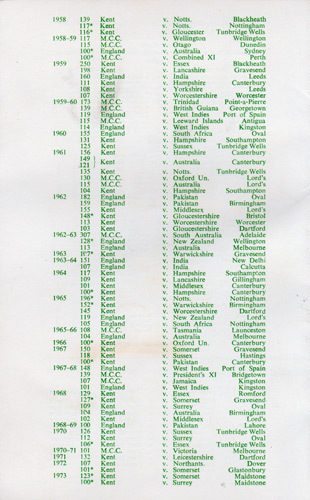 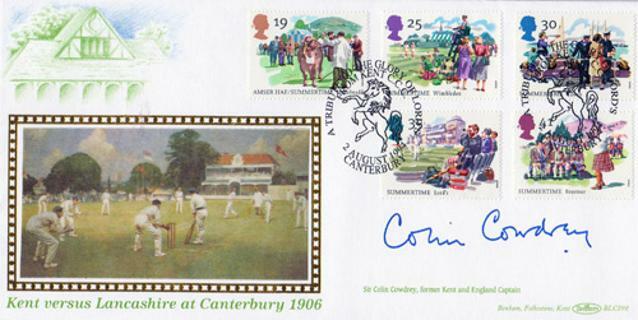 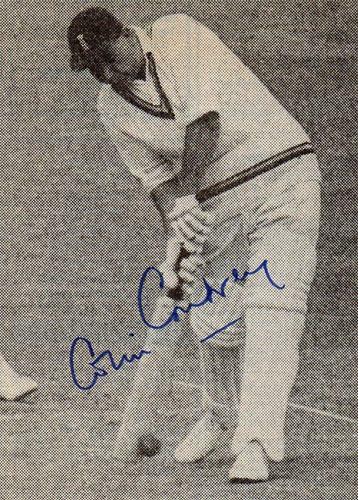 COLIN COWDREY signed Kent v Australians souvenir cricket programme match card celebrating the KCCC v Australia touring team matches from 1882-1975. 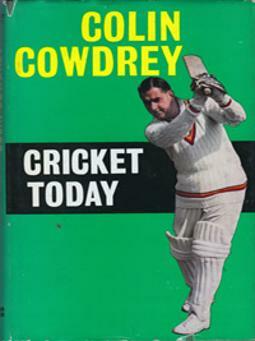 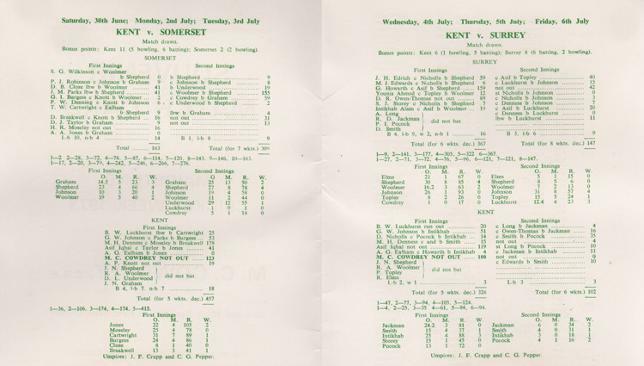 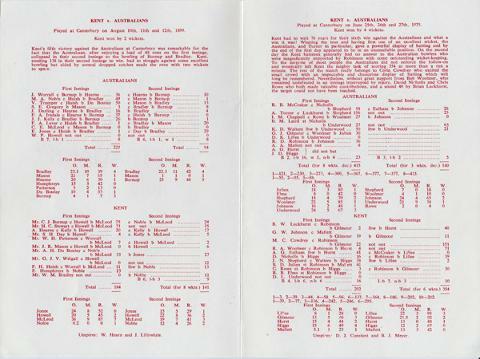 Inside the four-page brochure are printed replica scorecards for the 1889 & 1975 matches - with Cowdrey memorably scoring an unbeaten 151 as he led his county to a famous win over the tourists. 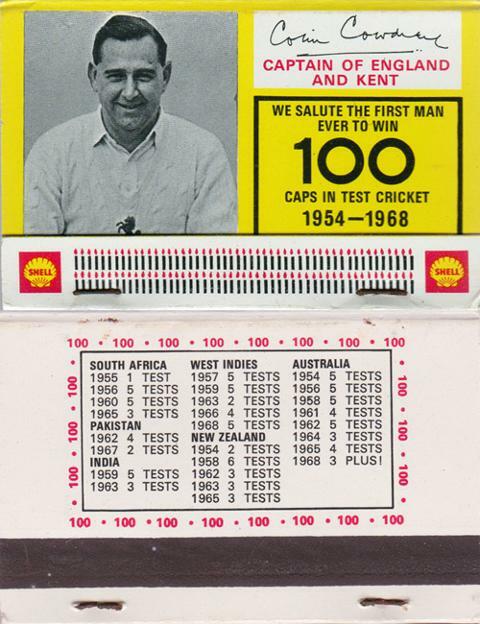 1968 Bryant & May / Shell match book celebrating the first player to win 100 caps in Test Cricket. 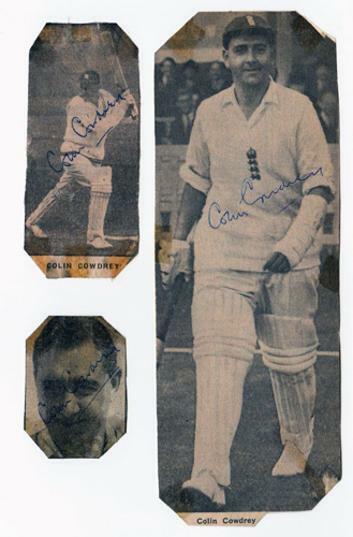 With printed autograph, portrait photo & career stats on reverse. 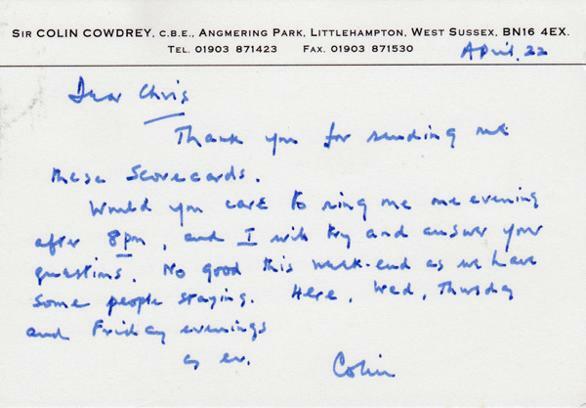 signed hand-written letter on Kentish Border, Bookwood Park, Limpsfield notepaper. 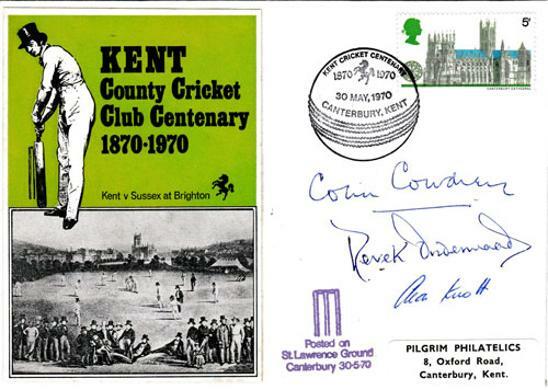 Signed hand-written compliments slip / postcard (sent from Angmering Park, Littlehampton, Sussex). 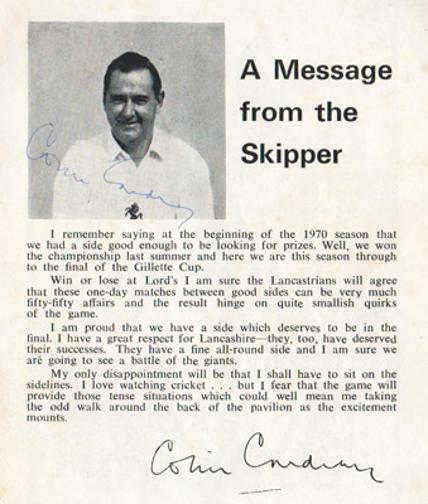 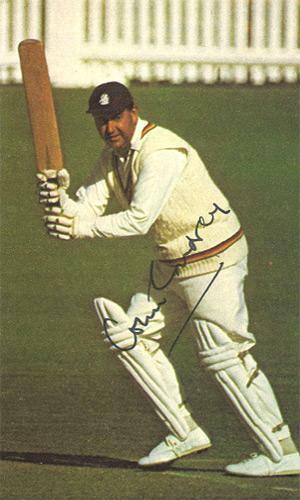 Signed "Message from the Skipper" article from the 1971 Gillette Cup Souvwenir Brochure. 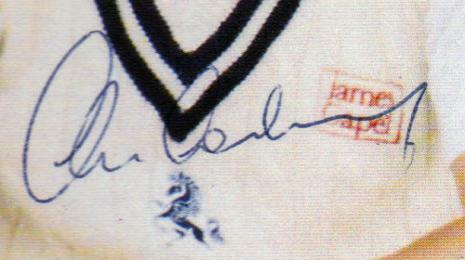 Original autograph across the B&W pic in blue ink. 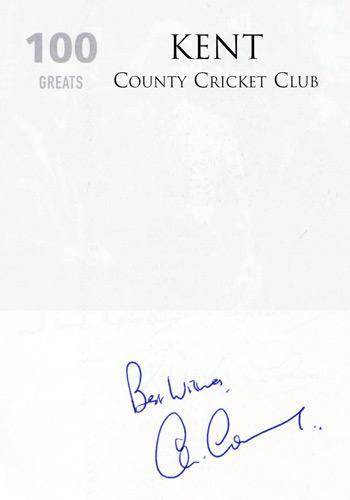 The autograph at the bottom is printed. 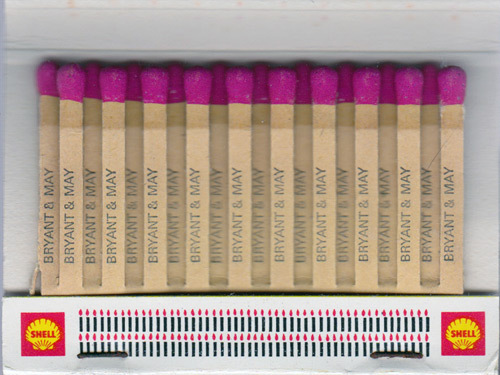 CONTACT US for price and delivery options in the UK only. 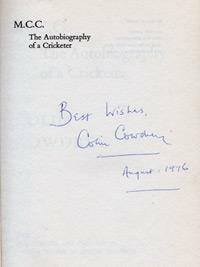 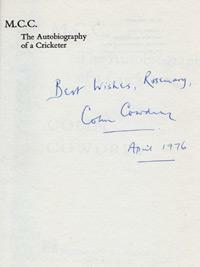 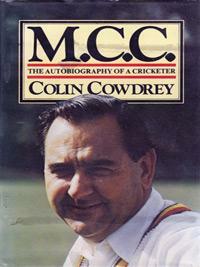 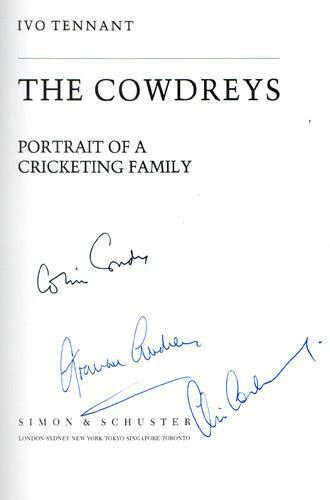 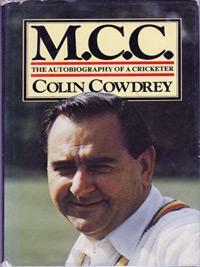 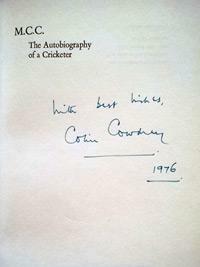 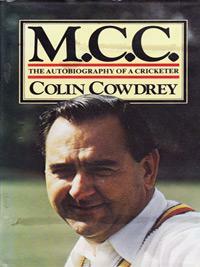 "MCC: The Autobiography of a Cricketer"
Signed "With Best Wishes 1976"
Signed "Best Wishes August 1976"
"Best Wishes, Rosemary April 1976"
"100 GREATS - Kent County Cricket Club"
Book signed by Colin Cowdrey & the authors David Robertson, Howard Milton & Derek Carlaw. 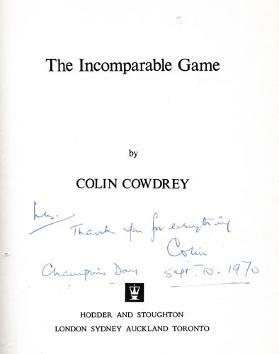 John Prodger & Alan Dixon. 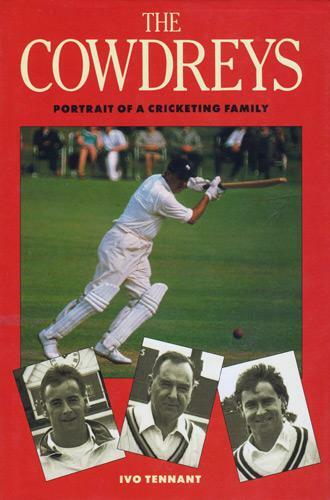 Bob Woolmer, John Shepherd, Alan Brown, Norman Graham, John Dye, Graham Johnson, Asif Iqbal, David Nicholls, Alan Knott, Derek Underwood, Mike Denness, Colin Cowdrey, Brian Luckhurst & Alan Ealham. 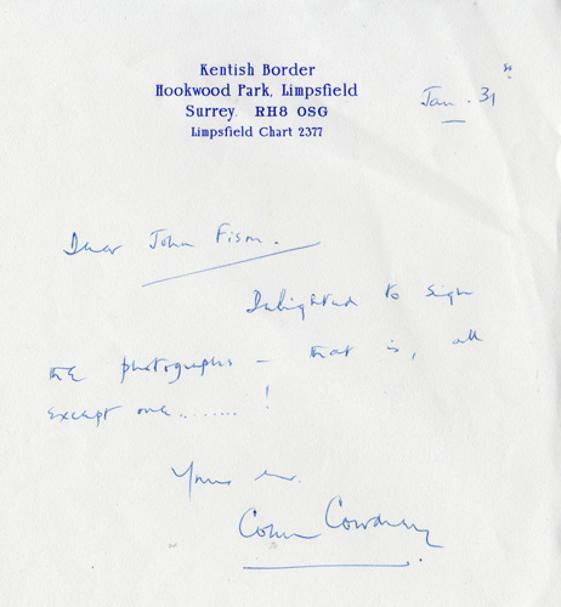 (Removed from a schoolboy scrapbook with sellotape marks, etc). 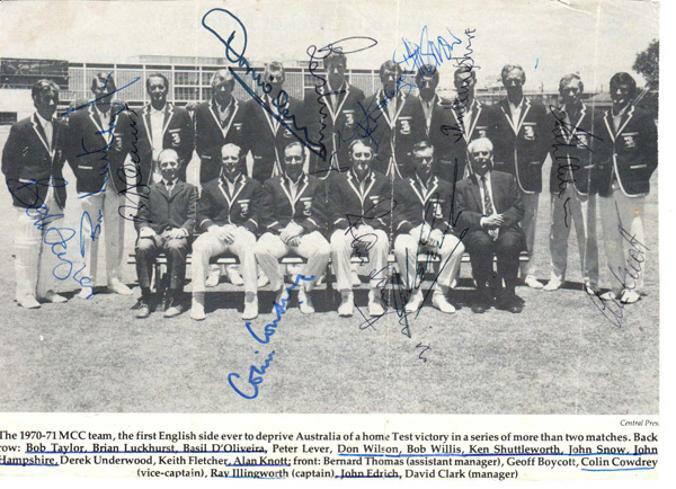 12 player autographs: Colin Cowdrey, Ray Illingworth, Bob Taylor, Brian Luckhurst, Basil D'Oliveira, Don Wilson, Bob Willis, Ken Shuttleworth, John Snow, John Hampshire, Alan Knott & John Edrich. 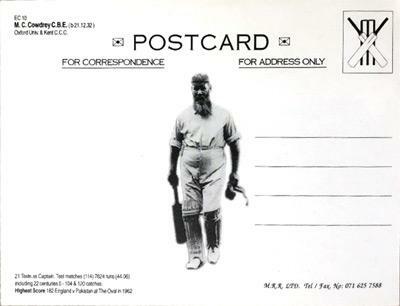 Approx size: 19 x 14 cms.